The Dow rose nearly 350 points Monday as fears of a possible trade war continue. 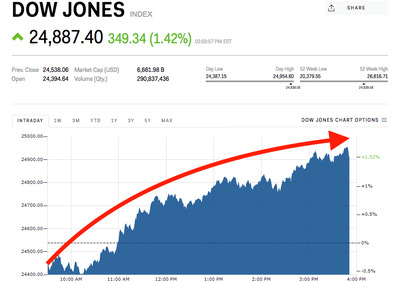 The Dow Jones industrial average gained nearly 350 points Monday, to close up 1.42% at 24,887, despite President Donald Trump saying that “we’re not backing down” on his proposed tariffs on imported steel and aluminium. The S&P 500 finished up 1.15% and the Nasdaq closed up 1.05%. Trump, in an Oval Office meeting with Israeli Prime Minister Benjamin Netanyahu, said Monday that he wouldn’t back down on his proposals. Shares of US Steel and Steel Dynamics sank slightly in trading Monday. The two had previously gained more than 4% when the news of the tariffs first hit on Thursday. Boeing,Caterpillar, and General Electric on the other hand, all gained more than 2% Monday. All three industrials had been hit hard last week by the news. Elsewhere, the 10-year yield rose two basis points to 2.88%, while West Texas crude oil gained 2% to $US62.69 a barrel.